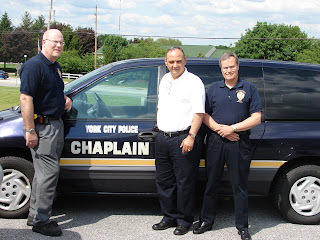 Numerous Grace Brethren pastors serve their communities as a chaplain for an area police department. One of those is Pastor Dan White of the York, Pa., Grace Brethren Church, pictured above at left. While Gonzalez and others mitigate conflicts, the Rev. Dan White works mostly with the police officers. “If we can minister to them, we can diffuse emotions,” White said. Lorrain, head of the chaplains organization, said the chaplains provide “a confidential ear that’s non-judgmental,” so officers can vent.